Pennsylvania State Senator Larry Farnese, who was indicted on a vote buying scheme on Tuesday, walks to a town hall meeting with the Center City Residents Association on Thursday, May 12, 2016 at Temple Beth Zion-Beth Israel. The political careers of the two men who held his seat before him ended in corruption convictions. 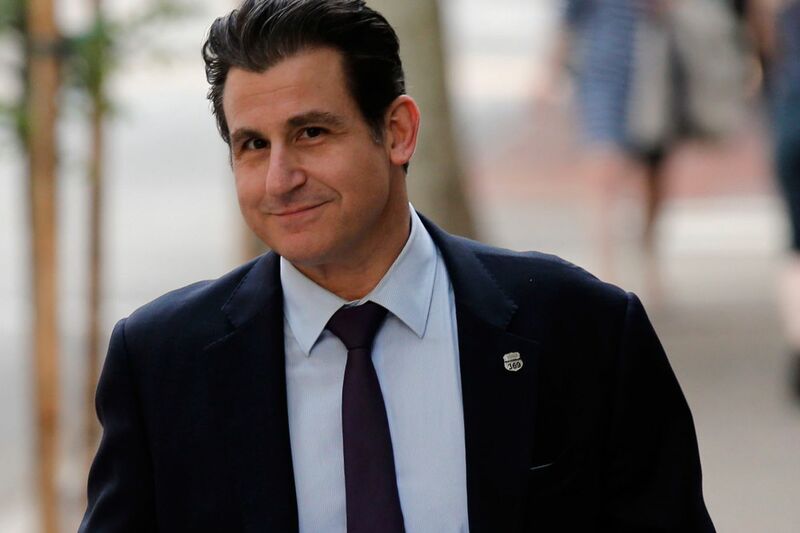 But State Sen. Larry Farnese hopes to avoid the trail blazed by Henry "Buddy" Cianfrani and Vincent J. Fumo as his federal fraud trial begins this week. U.S. District Judge Cynthia M. Rufe scheduled opening statements for Tuesday after she impanels the jury that will weigh the senator's future. Farnese, 48, is accused of using $6,000 in campaign funds to buy the vote of a committeewoman in his 2011 bid to become leader of South Philadelphia's Eighth Democratic Ward. A conviction would mark an ignominious end to his tenure in the General Assembly, eight years after he rode in on his credentials as a Center City lawyer and his vows to "restore the people's trust" in his office. The case also presents high stakes for the government amid defense accusations that prosecutors overstepped the bounds of their jurisdiction in their zeal to land another conviction. Farnese has said little publicly about the allegations since a grand jury indicted him and the committeewoman, Ellen Chapman, 62, in May. But in court filings and public forums during a successful bid for reelection to a third term last fall, he rejected the Justice Department's characterization of him as the latest in a string of corrupt politicians chosen by the voters of the Senate's First District. "I'm your neighbor," Farnese told the Center City Residents' Association the day after he was charged. "You've known me for years. But I want to assure you . . . if there was ever a time . . . where I thought that if anything I was doing was wrong or even inappropriate, I would never have done it." Many of the facts in the case remain undisputed. But what government lawyers have characterized as a bribery scheme with a clear quid pro quo, Farnese's attorneys defend as well within the boundaries of state campaign finance and antigraft laws. While seeking the ward leader post in 2011, Farnese instructed his political campaign fund to make a $6,000 donation to Bard College in Annandale-on-Hudson, N.Y., the school administering a study-abroad program in which Chapman's daughter hoped to take part. Chapman withdrew her support for Stephen Huntington, one of Farnese's rivals for the post, after the payment was made and, according to prosecutors, tearfully admitted to him that she was switching her vote to Farnese because he agreed to the payment. Farnese went on to win the ward election by a unanimous vote, and Chapman's lawyers maintain that she cast no ballot. They argue that prosecutors now are seeking to "criminalize many activities that are an accepted part of local politics." What's more, they say, the Justice Department has no jurisdiction over what essentially was an internal vote to pick the leaders of a private organization. "A prosecutor from Washington is going to come in and tell the Eighth Ward what the Eighth Ward should be doing?" defense attorney Mark Sheppard said at a hearing last week. But Special Assistant U.S. Attorney Jonathan Kravis argued in a recent filing that it was the Justice Department's duty to investigate criminal activity no matter where it occurs. Chapman, he wrote, defrauded the Democratic City Committee by failing to conduct herself honestly in her job as a committee member. Farnese, meanwhile, defrauded his campaign fund by failing to explain to its treasurer that the $6,000 donation to Bard was actually a bribe, Kravis said. "There is nothing 'routine' about paying bribes to party officials to influence them in decisions that they are supposed to make on behalf of the best interests of their party," he wrote. In addition to witnesses, including Huntington and Farnese's longtime political consultant Ted Mucellin, prosecutors say they intend to introduce email chains between Chapman and Farnese laying out the terms of their alleged deal. It remains unclear whether Farnese or Chapman will testify in their defense. The trial is expected to continue into early next week.